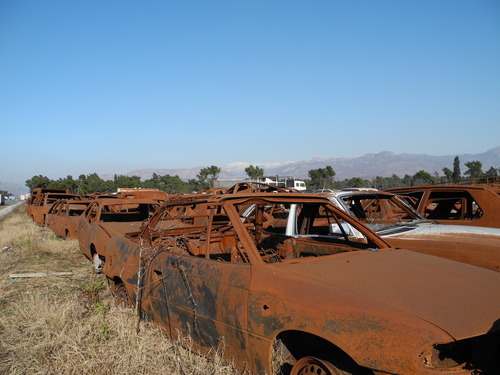 The land of Mercedes-Benz. That’s what everybody had told me beforehand: Every serious man in Albania owns a Mercedes. That and the word faleminderit (pronounce with American accent and stress on the third syllable) is pretty much all I know about the culture when I cross the border. —Passport please. Looks at passport and up again. First time Albania? Looks at me with sympathy. I have been warned about Albanian traffic. Eldi, my Albanian neighbor in Graz, said they “can’t really drive” and I should “take care” on the roads. Encouraging words. 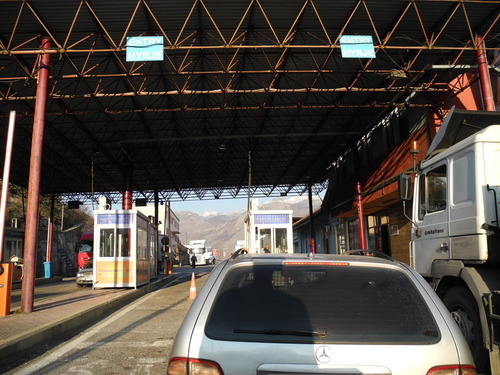 I take him seriously, but I neglect his advice to take a road South of lake Shkodra—I’m taking the mountain route via Podgorica. 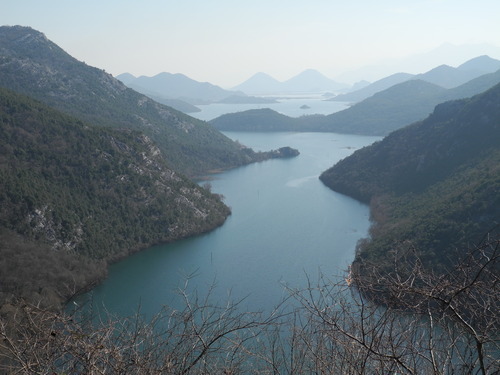 A decision I made yesterday when I chose to climb the 1000 m serpentine road above Kotor. 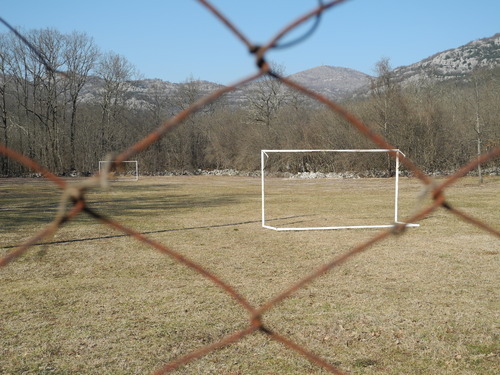 From my mountain camp in Montenegro, I want to make it to Shkodër in a day. It’s about 130 kilometers and I feel in good shape. The night beneath the stars was great and a little chilly. I slept with my tent half open and had to get up and close it in the middle of the night. Temperature must have been around zero degrees. 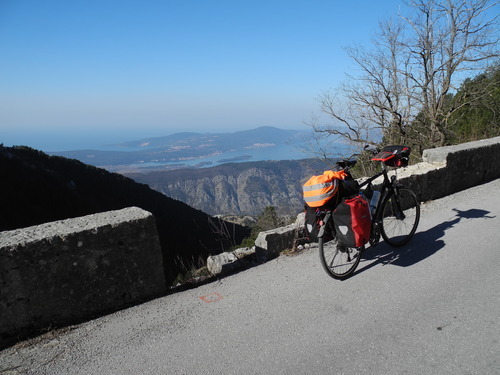 My second day of cycling in Montenegro offers even more stunning views from every point of the road. My route crosses a national park. 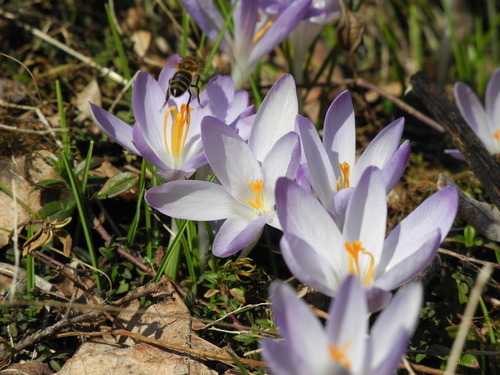 I see crocus on the side of the road and it feels like spring. 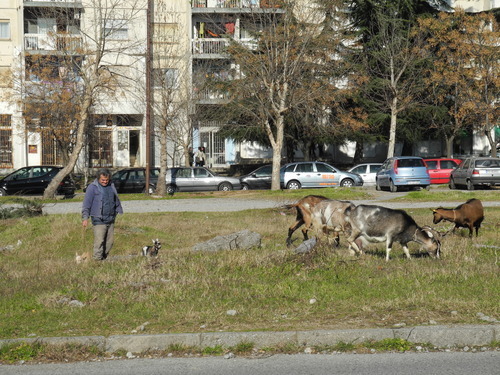 A shepherd watches his goats in a residential area. 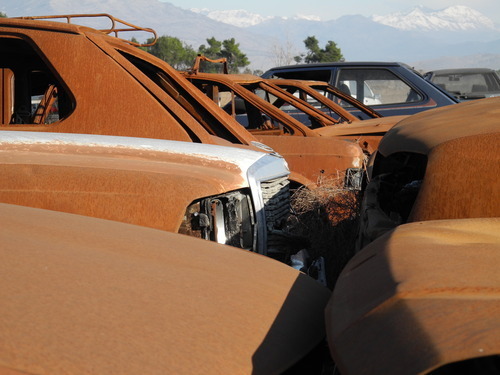 Car skeletons rest in pieces on a car cemetery. I meet the first fellow touring cyclists: Iwona and her companion (whose name I unfortunately don’t remember) from Poland who are just returning from a ten-month trip to Mongolia and China. We have a delightful chit-chat at the side of the road, until we continue in opposite directions. “It’s a very corrupt country”, Ehart says casually. “You can even buy teachers. You just go up to them and ask how much they want for a certain grade. Many people do it.” Ehart is Eldi’s cousin. Just like Eldi, he went to the Austrian school in Shkodër. He speaks a charming German. As he’s got an exam tomorrow (which he will not pass by slipping the teacher a note, he assures me), he cannot host me within his four walls, which is the reason I get to stay at the local hotel free of charge. That’s Albanian hospitality: You provide your guest with a bed for the night. No matter what. The hotel is being paid for by my friend Eldi and there’s nothing I can do about it. It’s an act of generosity—and all I can do is appreciate it and be grateful. Ehart leaves me after an hour, not without making sure I have everything I need. They are very caring, those Albanians, I think to myself as I fall asleep, tired as a sloth, in my fancy hotel room.